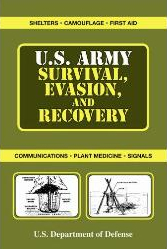 Compiled from the most relevant and important survival information offered by current U.S. Army personnel, and proved by past experience, this handy and concise guide will equip readers to survive in life-threatening conditions. Topics include evasion, navigation, radio communications and signaling, recovery, plant medicine, personal protection, and water and food procurement and preservation. This book covers a surprising array of essential information in straightforward, no-nonsense terms. Included are instructions for survival in nuclear, biological, and chemical conditions, tips for traveling in ice and snow, and rules for avoiding illness or harm in adverse conditions. This handbook is a must-have for military personnel, enthusiasts, and an indispensable survival guide for anyone venturing into the wilderness. Paperback; 5" x 7 1/2"